Oftentimes people feel stressed due to work, family struggles, or money troubles. However, to combat that anxiety many people go to a spa and receive treatments such as massages, oil treatment, and spa baths. Although not many people realize the various advantages that spas offer. In fact, not only are spas beneficial to a person’s overall health but are also crucial to a person’s mental health too. In particular, spa baths offer the body a chance to eliminate toxins, relax muscles, and provide the body with a healthy-heart pounding exercise. But what are other benefits of a spa bath? Many people wouldn’t believe that stepping into a warm bath would enhance your heart health; however, it’s been proven that taking a warm bath can improve your heart health. By stepping into a bath and letting the water flow up to your neck allows your heart to be exercised. Due to the pressure of the water, your heart will expand in volume, and thus be able to work harder. When your heart works harder, it becomes healthier since it’s able to adapt to extreme dynamics. For example, when a person works out their heart will most likely be pumping harder due to the pressure they are putting on their bodies to run, lift weights, or climb stairs. By sitting in a bath or warm body of water you’re essentially doing the same concept. However, the pressure you put on your body is different. Therefore, sitting in a spa bath can enhance your heart health; however, the results may vary depending on the time you sit and the temperature of the water. Many people disagree with the idea that sitting in a spa bath will improve your sleeping habits, however, the people who have tried it have found it to be beneficial to their sleep. 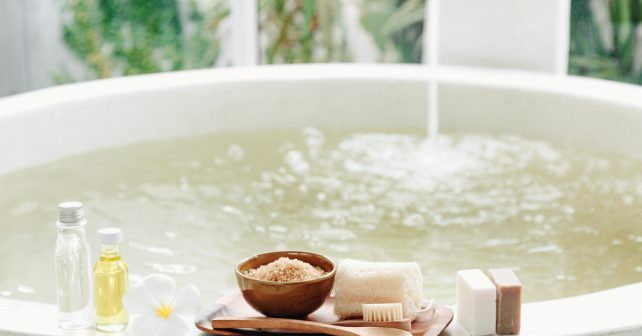 While sitting in a spa bath won’t directly improve your sleep it works with a combination of other factors to make you feel more relaxed, so you can sleep more soundly at night. For example, sitting in a warm bath will likely make you feel more relaxed about your day, and thus will decrease any anxious thoughts you might have before going to sleep. Moreover, you’ll probably sleep deeply because your brain is not readily thinking about your anxieties. Therefore, taking a spa bath works to decrease your stressors and anxieties, and thus you’ll be able to have a restful sleep. Many people experience aches and pains due to physical injuries, daily fatigue, or common sores. However, it’s commonly known that warm or hot water can ease such pains in the body. Spa baths, in particular, are popular for their relaxing techniques within bodily systems. Unlike other baths, spa baths focus on allowing the body a chance to rid itself of the tensions brought on by stress and anxiety. When a person steps into a spa bath, he or she is likely to experience dimmed lights, calming smells, soft and spongy items, and warm water. Such items are offered to help reduce tightness in muscles. Additionally, spa baths can also relieve muscles pains like pulled muscles and even arthritis in the joints. Therefore, spa baths not only ease aches and pains but do so by offering a variety of relaxing items that can aid a person in decrease tightness from their body. Most people don’t realize that by taking a spa bath, you’re also decreasing your blood pressure. For people who have a chance at heart disease or have hypertension, taking a spa bath is a great way to exercise your heart. Not only does it increase your pulse, but it also lowers your blood pressure. In fact, taking a spa bath is one of the best ways to exercise your heart if you don’t want to exercise at all since it provides your heart with all the necessary qualities of working out but none of the side effects. Additionally, spa baths are perfect for improving your heart health, and thus can be used strategically if you may be at risk for heart disease. However, it’s essential to consult a doctor and ask what course of treatment and prevention strategies are right for you. When most people hear the word ‘spa,’ they automatically think of an escape from current events. At a spa, people are likely to experience a decrease in stress and anxiety due to the calming nature of the facility. With dimmed lighting, scented candles, and softened and fuzzy items around people are presumably going to be more relaxed. In addition, spa baths add a level of comfort since they allow a person to immerse themselves in warm temperature water. The water offers the body relief and allows a person to be at ease with themselves as well as their body. Spa baths are generally noted for their winding down potential. In fact, people who have tried them found that they’re not only great for the body but also the mind as well. Therefore, spa baths allow a person to not only escape from stressors but be able to ease anxieties within both bodily systems and the mind. Many people don’t realize that by taking a spa bath, your eliminating toxins from your body. While it’s commonly known that heat opens your pores, it also can clean out your skin. The heat that’s used from the water can remove substances like vitamins, oils, and dirt that can be harmful to your body if it’s left in the skin for an extended period of time. After your skin is clean, you’ll likely feel refreshed and potentially energized from experience. It’s crucial that every once and a while you participate in the detoxification process to ensure that your body is healthy and robust. Therefore, by taking a spa bath, you’ll eliminate toxins from the body and also participate in a needed process for your body.